A warm welcome to Burley. 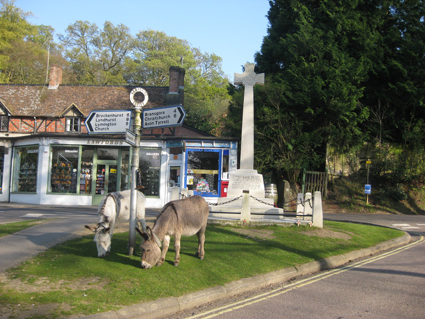 Come and explore one of the best well kept and prettiest villages in the New Forest. Our three New Forest Cottages are all located in the heart of Burley, all within just 100 metres, in country lanes just a 3 minute walk from the village centre. Steeped in history it has past connections with smuggling, dragons and witches but do not fear, the people are warm and friendly!. A perfect setting in the lea of a hill and surrounded by the most colourful and truly outstanding area of natural beauty, Burley offers something for everyone. Traditional locally built brick and thatched cottages tucked away in leafy lanes where the ponies and cattle wander at will. Commoning, the practice where the animals graze on the open forest is still seen in Burley. Look out for the ponies at your cottage gate!. Surrounded by miles of open forest you will have plenty to discover. The village has much to offer you and all within a three minute walk from your home from home. Why not hire a bicycle and try the local suggested trails, hack out for an hour or two from the local stables or play a round of golf. Pack a picnic and head off to where the iron age fort was built and look out to Bournemouth and Old Harry Rocks. Sample traditional home brewed cider.. Perhaps a cream tea for an afternoon treat or dine out for lunch or dinner at the three pubs ( yes, we have three!). They have designated areas for children and are happy to welcome your well-behaved dogs. Take a horse drawn wagon ride or go on the deer safari (seasonal). Our village post office stocks newspapers, magazines, cards, and stationery. The excellent village butcher also has a mini grocery section. A range of gift shops will inspire you and spoil you for choice. The fudge shop is mouth-watering ( no calories!). Catch up on what is happening in the monthly parish magazine provided in the cottage and read about farmers markets, local drama productions, fetes and events happening in the village. So much to see and do!